This Chocolate Glazed Donut Whoopie Pie recipe came from my love of Krispy Kreme Chocolate Iced Kreme Filled doughnuts. Since Krispy Kreme doughnuts aren’t available in Minnesota I wanted to figure out how to make doughnuts at home. My grandma used to make homemade doughnuts. She would top them with a maple glaze and they were so good. She always said that she wanted to come to our house one day to teach us how to make them. Unfortunately, it is one of those things that were never did together. I have so many precious memories of her and I can still taste her doughnuts when I think about them! Krispy Kreme came to Minnesota in 2002 and there were donuts shops everywhere. They only lasted 6 years but that was enough time for me to become very fond of the Chocolate Iced Cream Filled donuts. The last time we went to North Carolina, we had to stop at Krispy Kreme to get doughnuts. 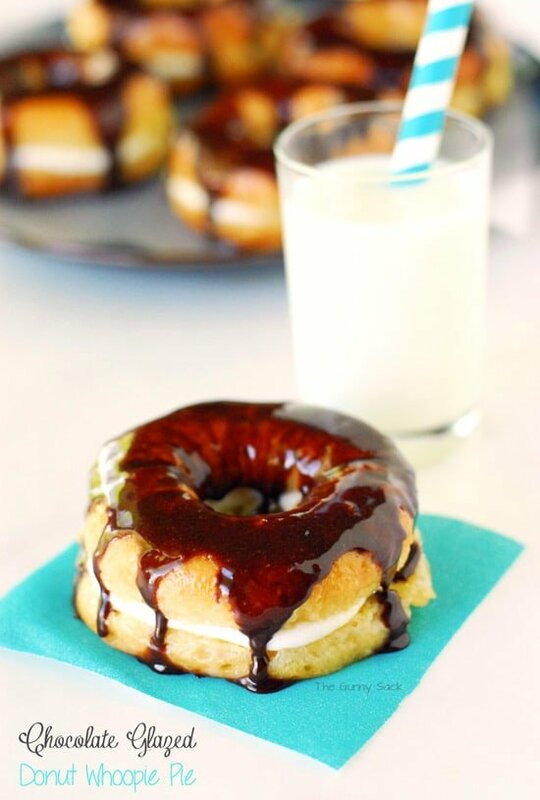 So, I knew that I wanted to make a doughnut with a cream filling. Since I had so much fun making Cinnamon Roll Whoopie Pies, I figured, why try filling donuts when I can just cut it in half and make a “whoopie pie” instead. Of course, these aren’t really whoopie pies but that is what they remind me of. 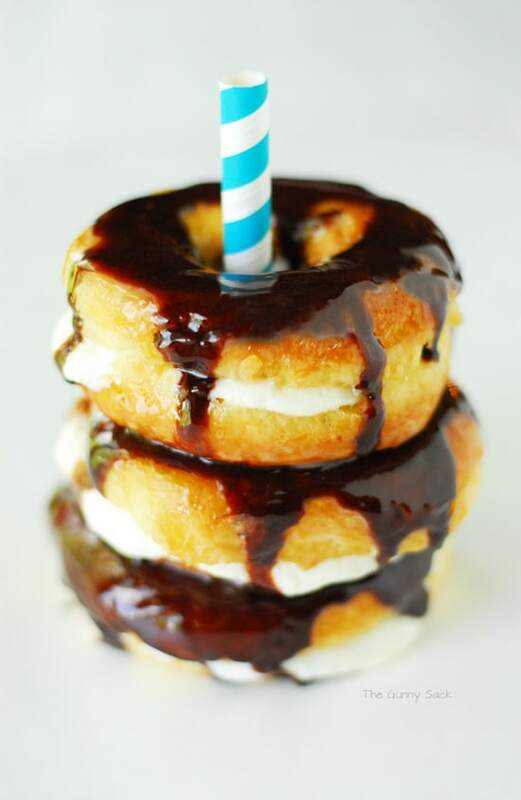 I could call them donut sandwiches but that isn’t as fun! 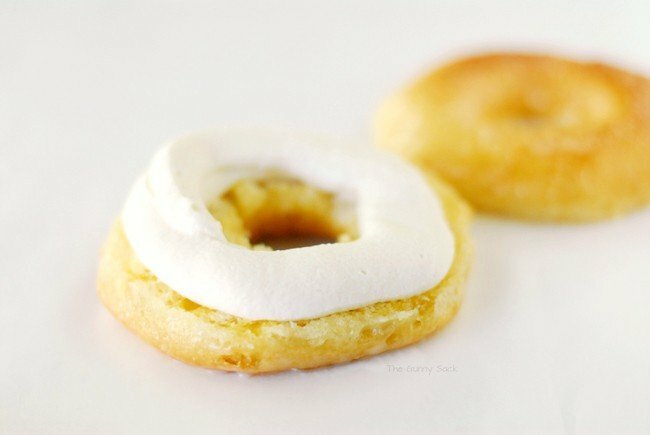 Since I am always short on time so I decided to go the easy route and make these doughnuts with Pillsbury Grands Flaky Layers Butter Tastin’ Biscuits. There were 8 biscuits in the package. Cut a hole in the center of each biscuit. Fry the donuts and donut holes in canola oil until golden brown. 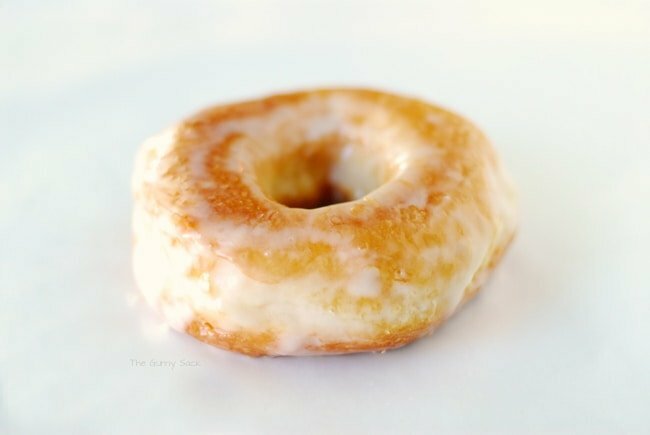 Mix up a thin glaze and drizzle it over the warm doughnuts. 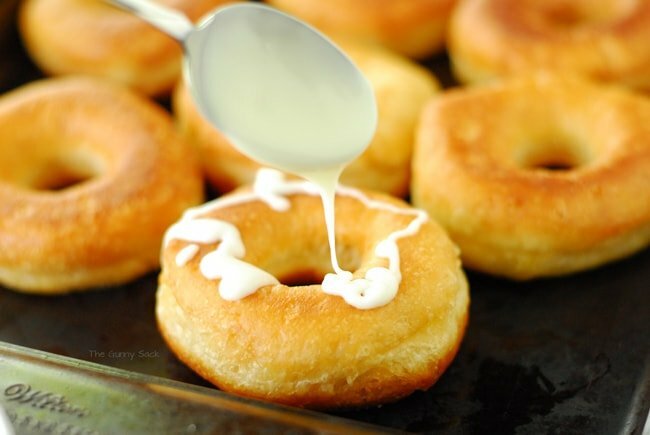 Use a knife to spread the glaze around so that it covers the doughnuts. They are ready to be enjoyed just like this. But of course, my love of frosting won and I couldn’t just leave them be. I put the doughnuts in the fridge to cool. While they were cooling, I mixed up the vanilla donut filling. When the filling is ready, cut the doughnuts in half and pipe the frosting on the bottom half. 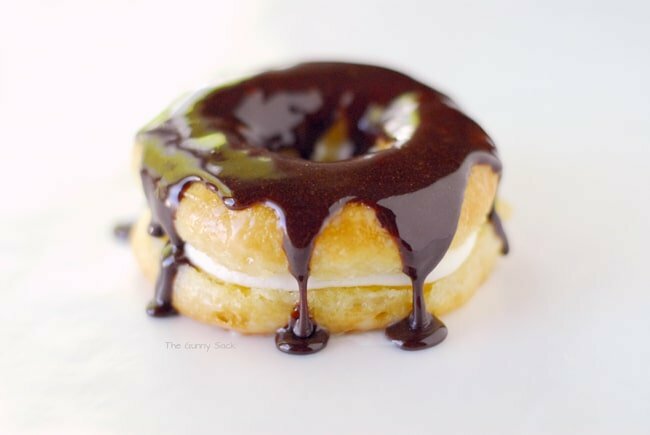 Add the top half of the doughnut and melt chocolate frosting in the microwave. 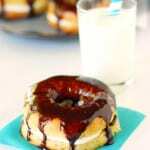 Drizzle the chocolate over the doughnuts and allow it to run down the sides. Oh yeah…that’s what I’m talking about! Totally unhealthy, soaked in grease, sugar laden and oh so good! Never leave oil unattended and watch it carefully! Cut centers out of biscuits and place in hot oil. Fry until golden brown before brown and then carefully flip over. When the second side is golden brown, removed from oil and drain on paper towels before moving to a wire rack. Mix together powdered sugar and cream. Drizzle glaze over still hot donuts. Spread with a knife to cover completely. Add powdered sugar mix until clumps form. Add vanilla and 2 tablespoons heavy cream. Beat until smooth. Add 1-3 tablespoons of heavy cream until filling is the desired consistency. Melt chocolate frosting in the microwave. Pipe cream filling onto bottom half. Add top half of donut. 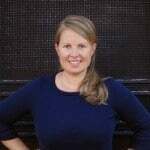 Tonia – As always, these look amazing. I wish I could reach in and grab one for a snack. Would you come over and share these at the Pinworthy Projects Party? Great photos Tonya; yum! These look amazing! JK, not the end. Question first: can I move in with you? why hello, delicious piece of heaven! These look so scrumptious! 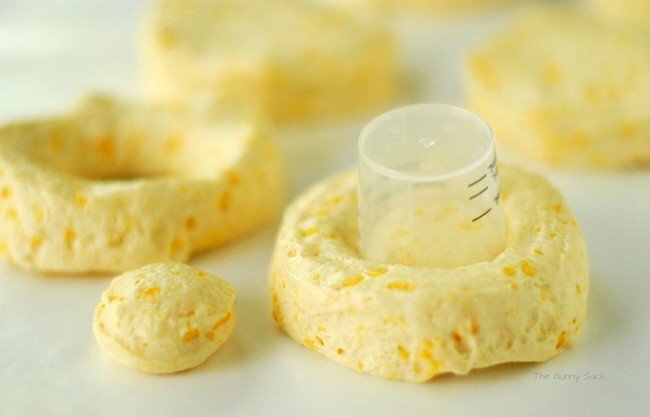 We made homemade doughnuts growing up too. (Never store bought…maybe that’s why the one’s in the boxes have a funny taste to me!) Pinning onto my Donut Board! Oh Tonia. I’m not sure whether I’d prefer you were a rotten cook or a poor photographer! Both are totally gorgeous. Who needs Krispy Kreme when there’s Tonia’s Treats? I like Zack’s description-Epic dessert! He’s onto something! 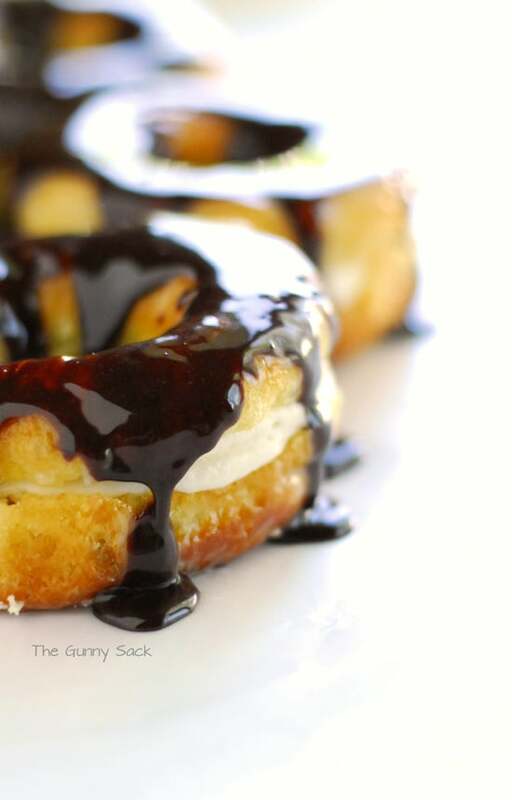 Donuts are always special in our house, this just makes them extraordinary! Love that these start with biscuits! You did it again! OMG Tonia! And…I have those biscuits in my fridge…. hmmmmmmm. Thank Dorothy! I can’t wait to see what you fry up! I live in NC and don’t eat Krispy Kreme as much as I would like too! I can’t believe how easy these look to make and they are homemade!! Yeah, it is probably better to save them for an occasional treat! 🙂 Thanks Nancy! Yummy! I am so in love with Krispy Kreme donuts. Thankfully we can easily get them here BUT this still looks like something I am going to have to make. Delicious. They are a bad thing to love, aren’t they? Wow, these look amazing! I make a lot of sweets and baked goods, but have never tried donuts. I definitely want to try out this recipe, though, it looks great. I too love Krispy Kreme. I would love for you to share this on my blog link party, Sweet Tooth Tuesdays! It’s going on for the next couple days.